A Catholic organization opposing transgender recognition in Spain says it will not be deterred from spreading its message after a judge in Madrid ordered one of its slogans to be removed from the side of a bus. Hazte Oir, a conservative group founded in 2001, will not be allowed to use its so-called ‘Freedom Bus’ in public until its anti-transgender slogan is removed. 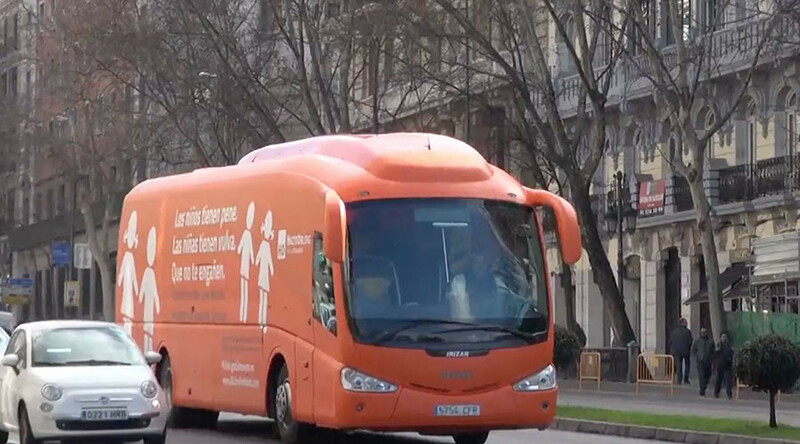 Following Madrid’s City Council’s opposition to the bus campaign, a local court ruled that the vehicle cannot be driven in public because it could harm the “dignity” of people with a “different” sexual orientation, reported El Mundo. Hazte Oir, which translates as ‘Make Yourself Heard’, stoked controversy last month with the slogan, which was labeled a “hate” message by People’s Party politician Javier Maroto. “Do not be fooled,” Maroto tweeted on February 28, “[It is] a campaign of hatred of LGTB”. In a statement, Hatze Oir said the yellow vehicle will “circulate in and around Madrid”. President of the group, Ignacio Arsuaga said their campaign will continue despite Thursday’s decision to block the ‘Freedom Bus’ slogan.